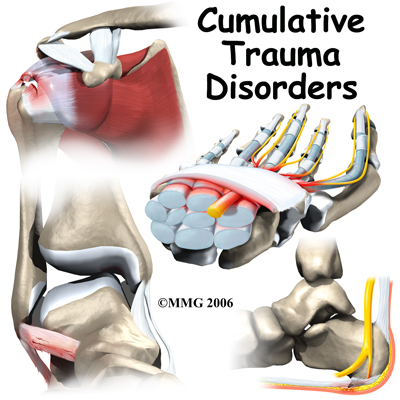 Welcome to Excellent Physical Therapy's patient resource about Cumulative Trauma Disorder. Cumulative trauma disorder (CTD) is a broad category that includes many common diseases that affect the soft tissues of the body. CTD in itself is not a disease. Doctors use the concept to understand and explain what may have caused, or contributed to, certain conditions. Examples of the conditions that may be caused or aggravated by cumulative trauma include carpal tunnel syndrome, tennis elbow, and low back pain. Other terms are often used to describe the concept of CTD. These include repetitive stress injury (RSI), overuse strain (OS), and occupational overuse syndrome (OOS). This document will refer to these categories generally as CTD. Using muscles and joints after they have become fatigued, or overly tired, increases the likelihood of injury. Overloaded muscles and soft tissues without proper rest have no chance to recover fully. This problem often hampers athletes who have to throw, jump, or run repeatedly. It can also affect people who work in jobs where they keep doing the same action again and again, such as typing, gripping, and lifting. All body tissues are in a constant state of change. Minor damage occurs continuously, which the body must repair in the normal course of a day. But the damage can occur faster than the repair mechanisms can keep up with it. When this happens, the tissues become weaker. They may begin to hurt. The weaker the tissues become, the more likely they will suffer even more damage. A cycle begins that looks like a spiral--constantly downward. Some doctors think muscle tension causes CTD. To function, or work properly, the body and each of its parts needs a steady supply of blood, rich in oxygen and nutrients. Nutrients are the body's fuel--glucose, for example. Cutting off or slowing the blood supply harms the tissues of the body. Tense muscles are believed by some to actually squeeze off their own flow of energy and fuel. Muscles can get energy without oxygen, but the process produces a chemical called lactic acid. This chemical can be a potent pain-causing chemical. Lactic acid is a chemical that can produce a burning feeling when muscles are overexercised. Some physicians believe that lactic acid produced by tense muscles may cause some of the symptoms of CTD. As pain develops, muscles tighten even further because they attempt to guard the surrounding area. Guarding is a term that is used to describe a reflex that all muscles in the body share. When pain occurs anywhere in the body, muscles around the painful area go into spasm (they tighten uncontrollably) to try to limit the movement in the area. As a result, blood flow is slowed down even more. The muscles begin to ache more. The nerves that have their blood supply reduced and squeezed by muscles begin to tingle or go numb. This theory suggests that nerves become extra sensitive when they've become shortened and irritable. It is thought that poor postures used over long periods causes muscles to bulk up and interfere with blood flow. The nerves that course through the body then become shortened and may begin to stick to the nearby tissues. Moving the arm or leg puts tension on the nerve and can cause pain to radiate along the limb. The problem is thought to get worse from stress because the muscles and nerves tense up and become even tighter. Also, when the same activities are done over and over again, the tight nerve is pulled and strained to the point that it can't heal and eventually becomes a chronic source of symptoms. Problems with CTD tend to be more common among people who suffer from boredom, who have poor working relations, who aren't satisfied with their jobs, and who have unhappy social circumstances. Reasons why this is so are unclear. The number of CTD cases reported may also be influenced by state worker's compensation rules. States where claims are processed quickly and with greater benefits tend to have higher volumes of CTD cases. Both of these findings suggest that many cases of CTD may be highly influenced by the patient's perception of the overall situation. Some patients may subconsciously, or consciously, rationalize their symptoms due to many factors that are not medical but have to do with their overall job and social situation. A newer theory suggests that there isn't really an injury going on in the soft tissues where symptoms are felt. Instead, the problem is said to be coming from influences within the mind. It is theorized that the brain starts producing pain signals as a cover-up for deep-rooted feelings of past emotional pain or problems. Though the idea sounds hard to believe, practitioners using this approach claim they have had success rates as high as 95 percent. Their patients are reported to have gotten swift relief from treatments aimed at the underlying and unconscious emotional triggers. One of these risk factors alone may not cause a problem. But doing a task where several factors are present may pose a greater risk. And the longer a person is exposed to one or more risks, the greater the possibility of developing CTD. Many different symptoms can arise from the accumulation of small injuries or stresses to the body. CTD is not so much a disease as it is a response to excessive demands these factors can place on our bodies without giving them adequate time to recover between. What does CTD feel like? The symptoms of CTD usually start gradually. Patients usually don't recall a single event that started their symptoms. They may report feelings of muscle tightness and fatigue at first. People commonly report feeling numbness, tingling, and vague pain. Others say they feel a sensation of swelling in the sore limb. Some patients with arm symptoms sense a loss of strength and may drop items because of problems with coordination. Symptoms often worsen with activity and ease with rest. When you visit Excellent Physical Therapy, our Physical Therapist will begin the evaluation by taking a history of your problem. We’ll probably ask questions about your job, such as the type of work you do and how you perform your job tasks. Answers to other questions will give us information about your work conditions, such as the postures you use, the weights you have to lift or push, and whether you have to do repetitive tasks. We may also ask about how you like your job and whether you get along with your supervisors and coworkers. Our Physical Therapist will then do a thorough physical examination. Your description of the symptoms and the physical examination are the most important parts in the diagnosis of CTD. We will first try to determine what conditions are affecting you. For example you may have symptoms of carpal tunnel syndrome or tennis elbow that need to be treated. Second, our Physical Therapist will try and determine if cumulative trauma is playing a role in your condition. If so, part of the treatment will be to try and eliminate the source of the cumulative trauma. There are no specific tests that can diagnose CTD. There are many different tests that may be ordered as we look for specific conditions. Excellent Physical Therapy provides Physical Therapist services in Bedminster and Somerset County. How can I help prevent problems of CTD? The best medicine for treating CTD is to prevent the problem from occurring in the first place. Key items to consider when attempting to prevent problems with CTD are listed below. Use healthy work postures and body alignment. Posture can have a significant role in CTD. Faulty alignment of the spine or limbs can be a source of symptoms. Using healthy posture and body alignment in all activities decreases the possibility that CTD will strike. Incorrect posture may lead to muscle imbalances or nerve and soft tissue pressure, leading to pain or other symptoms. Most people spend many hours at their work place, and using unhealthy posture during these long hours increases the likelihood that CTD will develop. Assessing where and how a person does work is called ergonomics. Even subtle changes in the way a work station is designed or how a job is done can lead to pain or injury. Rest and relaxation (R and R) have recently become front-line defenses in the prevention of CTD. Methods can be as simple as deep breathing, walking, napping, or exercising. This strategy is useful during work and off hours. Whether at home or work, our bodies need time to recover, which simply means giving them a chance to heal. Rest and relaxation allow the body to recover and provide a way of repairing these injured tissues along the way, keeping them healthy. Be relaxed. Try to work with your muscles relaxed by pacing your work schedule, staying well ahead of deadlines, and taking frequent breaks. Stop to exercise. Gentle exercise performed routinely through the day helps keep soft tissues flexible and can ease tension. Change positions. Plan ways to change positions during work tasks. This could include using a chair rather than standing or simply readjusting your approach to your job activity. Rotate jobs or share work duties. This can be fun by offering a new work setting, and it allows the body to recover from the demands of the previous job task. Avoid caffeine and tobacco. These can heighten stress, reduce blood flow, and elevate your perception of pain. What can I expect with treatment? Getting treated right away for symptoms of CTD can shorten the time it takes to heal. Symptoms can sometimes go away within two to four weeks when steps are taken quickly to address the factors that may be causing your symptoms. However, people who keep doing activities when they have symptoms and don't seek help right away may be headed for a long and frustrating recovery time, perhaps as long as a year. At Excellent Physical Therapy many nonsurgical treatment approaches are used by our Physical Therapy and occupational therapists to reduce the symptoms of CTD-related conditions. Our Physical Therapist will want to gather more information and will further evaluate your condition. The answers you give along with the results of the examination will guide us in tailoring a treatment program that is right for you. Our Physical Therapists often begin by teaching patients relaxation techniques which may include helping you learn to breathe deeply by using your diaphragm muscle. Taking the time to relax and breathe deeply eases tense muscles and speeds nutrients and oxygen to sore tissues. We may suggest that you wear a splint initially to protect and rest the sore area. Anti-inflammatory drugs, suggested by your doctor, are often used together with therapy treatments, which may include heat, ice, ultrasound, or gentle hands-on stretching to reduce pain or other symptoms. Our Physical Therapist may use muscle stretching to restore muscle balance and to improve your posture and alignment. We sometimes apply stretches that are designed to help nerves glide where they course from the spine to the arms or legs. Strengthening exercises are also used to restore muscle balance and to improve your ability to use healthy postures throughout the day. Our Physical Therapist will pay close attention to your posture and movement patterns. You may receive verbal instruction and hands-on guidance to improve your alignment and movement habits. Helping you see and feel normal alignment improves your awareness about healthy postures and movements, allowing you to release tension and perform your activities with greater ease. We will spend time helping you understand more about CTD and why you are experiencing symptoms. Our Physical Therapist may provide tips on how to combat symptoms at work using rest and relaxation. You may also be given specific stretches and exercises to do at work. Our Physical Therapist may visit your work place to analyze your job site and to watch how you do your job tasks. Afterward, we can recommend changes to help you do your job with less strain and less chance of injury. These changes are usually inexpensive and can make a big difference in helping you be more productive with less risk of pain or injury. At Excellent Physical Therapy, our goal is to help you understand your condition, to look for and change factors that may be causing your symptoms, and to help you learn how to avoid future problems. When your recovery is well underway, regular visits to our office will end. Although we will continue to be a resource, you will be in charge of practicing the strategies and exercises you've learned as part of an ongoing home program. Surgery is rarely indicated for CTD. Specific conditions that can occur as a result of CTD may require surgery. Unless the doctor is quite sure there is a structural problem, such as a pinched nerve or severely inflamed tendon, then surgery is not usually suggested.